Another Workday & On the Road Again! Friday morning was an occasion for a half-day workday. Brothers and sisters from the Huntsville Church of Christ at French Camp, MS came our way early. 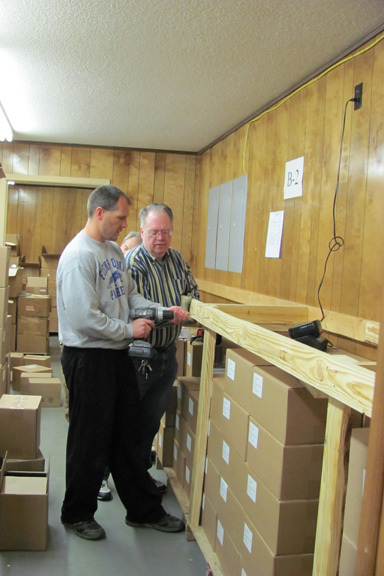 Nathan and Jim Wright built yet another shelf in our book warehouse; thereby, we can increase the storage space – as space is at a premium. 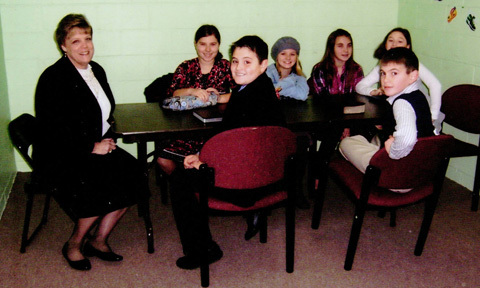 In addition, three sisters worked with Bonnie (as well as Paul and Jerry Bates) in preparation of a shipment of literature and books to South Africa; about 50 boxes were prepared before directing their attention to other helpful functions in the World Evangelism Building. Philemon Rajah from India was visiting for the week, and we put him to work, too. We’ll lodge and feed brethren who pass through, but we almost surely will put them to work as well! Of course, we found occasion to eat together before parting company that afternoon. Willie Nelson’s refrain, “on the road again,” is the ring tone for Bonnie’s phone, and how true it is for the two of us. We typically travel about 3,000 miles monthly by car in the States. Friday night, we made our way to our private Bed & Breakfast (our daughter Rebecca’s home) in Collierville, TN. Half a day Saturday, Bonnie and Rebecca attended the Ladies’ Inspiration Day hosted by the Collierville Church of Christ. Immediately thereafter, Bonnie and I pointed the silver minivan toward the Arkansas Ozark Mountains. 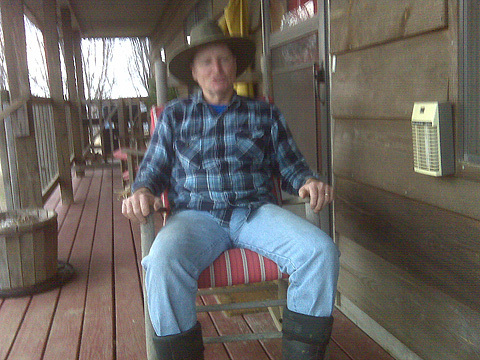 That night, we were guests in the cabin home of dear Christian friends; he serves as an elder and the preacher for the local congregation. No red light in the hamlet but amply compensated for the lack of bustle by the blue peaks, open fields and friendly folks. For Bible class Sunday, I made my PowerPoint presentation (Motivated by the Cross) about our mission work; during worship, I presented a faith-confirming, uplifting PowerPoint entitled, Bible Archaeology. After Chinese cuisine for Sunday lunch, Bonnie and I headed over the mountains northeast to our evening appointment – about three hours distance driving. GPS keeps me guessing! Saturday evening, I was sure it was confused and at times taking us in the exact opposite direction than we needed to go. This time, though, GPS brought us into the correct neighborhood by a different, somewhat obscure route. We were within half a mile from where we needed to be when GPS said we had arrived. Up the hill, around the bend, alas we weren’t lost after all! Sunday afternoon, GPS took us on some roads that do not appear on our atlas, and though GPS was confident that we had arrived at the coordinates we specified, we had really intended the same house number an equal distance north of the town instead of west of the town to which we were going. However, the time being what it was, we were content to be in the town where we would worship with good brethren and supporters of our mission work. Frankly, we had little more time than to set up the equipment and literature, so we were pleased. Once more that day, I preached, Motivated by the Cross, we were well received by good brethren. Sunday evening, Bonnie and I drove through the darkness toward our very own Bed & Breakfast (see above). Both on Saturday and Sunday, we were taxed with complicated highways exits that promised food and bathroom breaks, but rather twisted us in knots of frontage roads and miscellaneous ramps – seeming to shout at us, “You can’t get here from there!” With some false exits and re-entries to the highways and a measure of frustration, we didn’t starve after all. We made it back to Collierville, TN by 2300 hours. 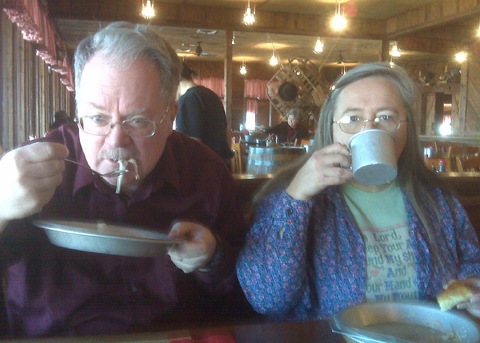 Monday advertised itself to our minds as a leisurely morning return to Winona, MS. We thought that we would punctuate the start of the day with breakfast at Cracker Barrel. Hah! Instead while about to leave Collierville, the left rear tire of the car went flat! Do you know where the spare (donut) tire is on a Town & Country minivan with Stow N Go seating? It’s under the car between the two front seats! Great, an opportunity to use the AAA Roadside Service for which I have been paying for years. About an hour later, the spare is on and breakfast, here we come. After breakfast, what could be simpler than taking the van to Sam’s Club about a mile away to have it honor the road hazard on the tires I purchased from them a year ago? Three hours or so later, the nail was located and extracted from the tire, and it was patched, and the tires were rotated. One can only imagine how many days might have been required to make a simple repair of a flat tire had we not been in a metropolitan area! Bonnie and I rolled into 705 Devine Street, Winona, MS at 1800 hours. Comments: Comments Off on Another Workday & On the Road Again! Faithful members of the churches of Christ (both brothers and sisters in Christ) are welcome to submit short, teaching articles for consideration to publish in Gospel Gazette Online (www.gospelgazette.com) or The Voice of Truth International magazines. Articles neither need to be exclusive to us nor do they have to be new articles (i.e., used bulletin articles you have written will serve well). GGO is a monthly that is read worldwide, and TVOTI is a quarterly that circulates in English into about 80 countries (and is also available in Spanish, Tamil, Telegu and Braille). 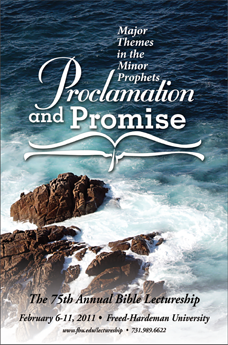 Articles should be about biblical subjects and suitable for the edification of Christians and non-Christians. For GGO, submit a jpg color picture to accompany publication of your articles. Please also include a brief biographical sketch, too, so that we can become acquainted with you. Especially shorter articles are more likely to be printed to complete page space at the bottom of other articles in TVOTI. Send computer files (e.g., MSWord, etc.) as attachments to email to rushmore@gospelgazette.com. Both Gospel Gazette Online and The Voice of Truth International are archived indefinitely in digital format on the Internet. Between the two magazines, thousands of articles are available in print and digitally throughout the world. Tuesday evening, Bonnie treated us to a feast! (We don’t ordinarily eat off the good china, use the better silverware and have as well rounded assortment of foods, except when we have company!) 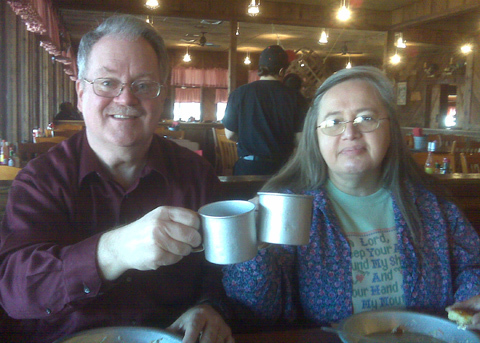 Our dear friends, Bob and Martha Noland, were to return home to Hanoverton, Ohio on the morrow. In addition, Philemon Rajah from India had been visiting World Evangelism for the past few days, too. 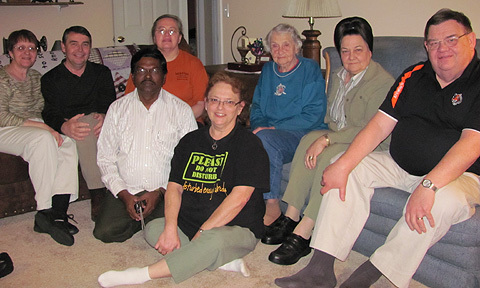 This was a suitable occasion to round up Betty Choate, Theola Burton (Betty’s mother), Jerry and Paula Bates (also with whom we work daily in World Evangelism), Bob and Martha Noland, Philemon Rajah as well as Bonnie and me for a home cooked meal together. Frankly, any excuse will do to facilitate Christians getting together around some good food and to enjoy one another’s company. The dinner menu included homemade honey-wheat bread in personal-sized loaves, real mashed potatoes with ample butter, pecan-battered boneless chicken breasts, green beans, candied baby carrots, gravy, broccoli salad and hot fudge cake with ice cream for dessert. 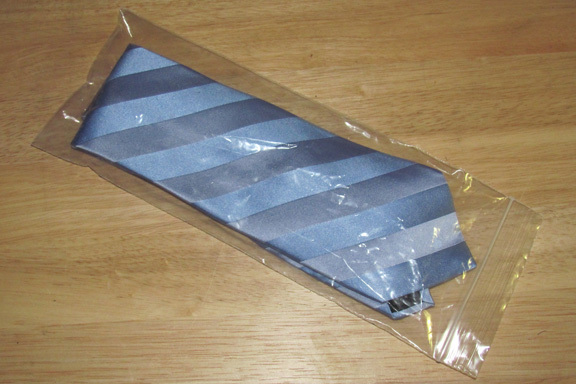 (Bonnie has made me into the man that I am today—in more ways than one!) 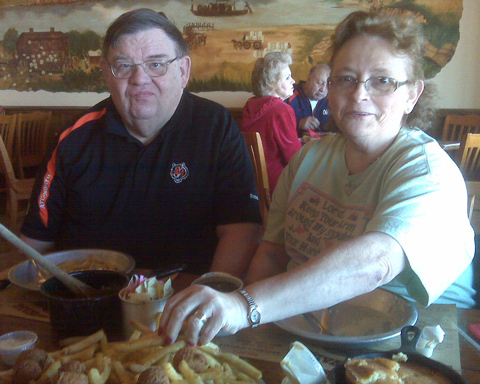 Friends are welcome to take supper with us; just call ahead to make sure that we are home! The 5th and 6th Grade Class of the Walnut Grove Church of Christ in Benton, KY once more is a great encourager of Bonnie and me. 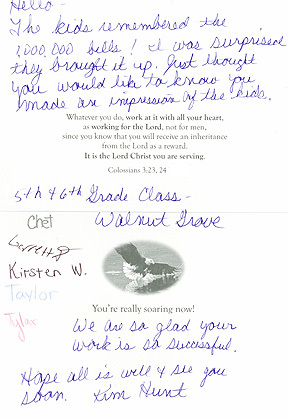 Last year on the day before our departure for one of our overseas mission trips, we received notes of encouragement from these youngsters. More recently, we received a card with their signatures. It seems that they remembered our visit to the congregation and brought it up to their teacher, Kim Hunt. Moral support such as we derive from Chet, Garrett, Kirsten, Taylor and Tylar is as important as the financial participation we receive from time to time from Christians and churches of Christ. We would be deficient in preparation for overseas mission work without either. In appreciation for the tender hearts who continue to be a source of encouragement and uplift to Bonnie and me, we sent the class a box of books so that each of them can begin his or her library of Bible study books. I autographed for each of the class members a copy of my book, Bible Geography. What a Surprise to Mississippi Kudzu! 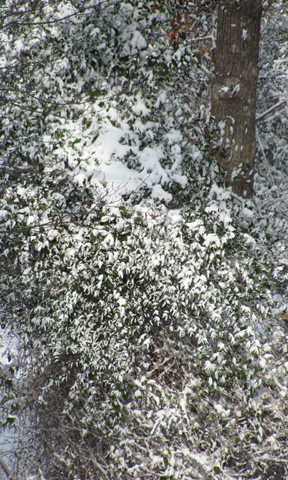 Wednesday, February 9th, afternoon through the night bowed to another Mississippi snow squall. 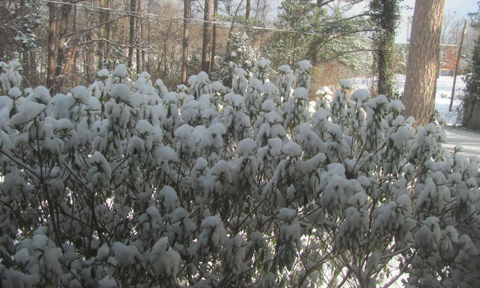 Bonnie and I took Thursday as our second self-imposed snow day this season. Of course, even this winter weather is spotty and less intense than winter weather elsewhere throughout the States. Yet, unpredictable, far-flung ice, snow, frigid temperatures and hefty winds have buffeted most of the Continental United States in 2011. (I don’t know how much more of this global warming I can stand!) Doubtless, additional to southern residents, Mississippi Kudzu was no less surprised to find something that could outstrip even its stretch and the rapidity with which it covers anything that doesn’t move fast enough. 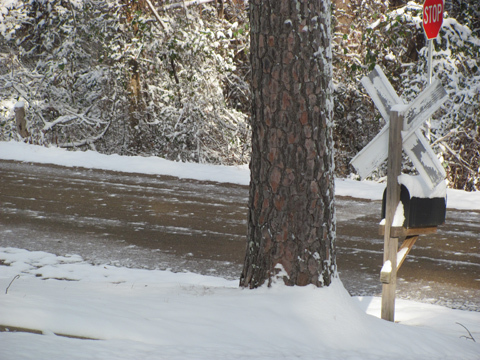 Notice a few pictures snapped from the comfort of our Winona, MS home through the windows. The photo out our bedroom window looks a bumper crop of cotton down here in the land of cotton. Decades ago when I first heard that Persian rulers maintained summer and winter palaces, I have thought that would fit me perfectly; I hate cold, and I hate hot, humid weather. Alas, we have never decided where to go or not go on God’s green earth based on personal preferences. Bonnie and my determination to serve our Lord has taken and continues to take us across the globe. Comments: Comments Off on What a Surprise to Mississippi Kudzu! Thursday and Friday the 3rd and 4th, Paula Bates, Bonnie and I finalized a fresh look of the World Evangelism display in preparation for the upcoming Freed Hardeman University Lectureship. 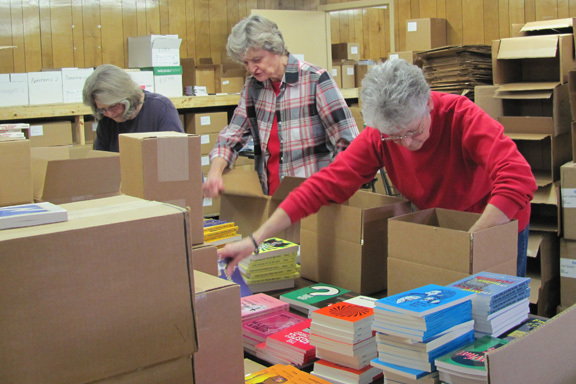 Friday, we also packed boxes of books from J.C. Choate/Louis Rushmore Publications to display in the exhibit hall for the lectureship; this is the literature arm of World Evangelism. Saturday morning, Bonnie and I loaded a small trailer and our van for the trip to the lectureship in Henderson, TN. From Winona, MS to there was about three hours. 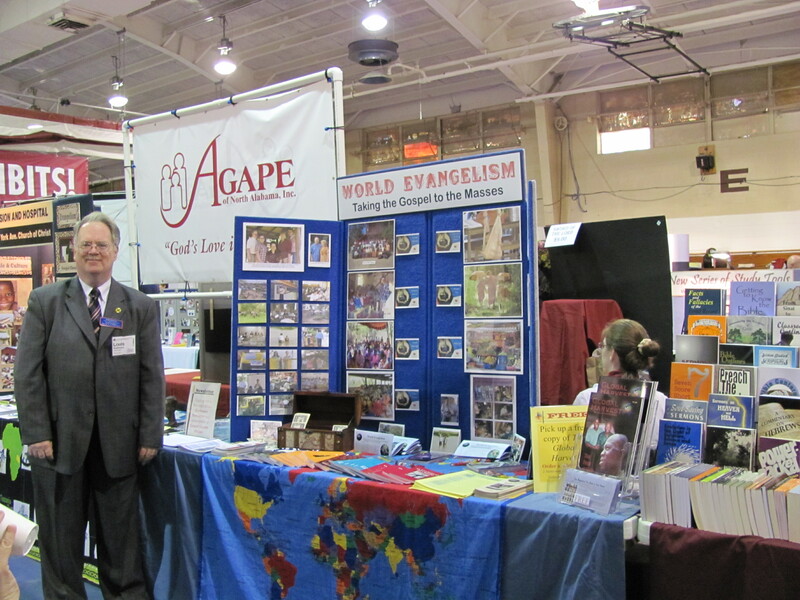 We met Paula and Jerry there in the afternoon to set up the World Evangelism display and J.C. Choate/Louis Rushmore Publications books. Jerry had just arrived back in the states Friday night from weeks abroad in Nepal and India; it’ll be several days before he completely adjusts to the 12-hour difference in time zones between the other side of the planet and here. For the next several days, Bonnie and I were fortunate to enjoy the hospitality of Randy Gaddy, a Master’s Program student at FHU. We attended several lectures, renewed acquaintances and friendships as well as distributed literature. Sunday the 6th, it was our pleasure to spend the day with the Milledgeville, TN Church of Christ. I taught about the parables of Jesus Christ at the morning Bible class and during the two worship services. I first became acquainted with this small congregation last fall upon our return from India and Burma when I held a three-day Gospel meeting for these brethren. Wednesday, we scurried out of Henderson, down US 45 into Mississippi and toward Winona. I was scheduled to continue teaching a series of lessons about the identity of the Lord’s church at the West President Church of Christ in Greenwood, MS. We started our homeward journey around 10:30 a.m. to get ahead of another monster winter storm about to buffet the southeastern US. We managed to get home barely ahead of it, but the inches of snow and plunging temperatures resulted in the cancellation of the Wednesday evening class at West President. Working up until midnight after the lectures and working still more upon arriving back in Winona, I was able to finish the January issue of Gospel Gazette Online and upload it to the Internet. Yes, I’m late – hardly a desirable situation, but the result of trying to play catch up since our return in November from our mission trips. Of course, other matters like working on manuscripts to be printed next, loading and unload trucks of literature, stateside traveling, eating and sleeping have a tendency to demand attention, too.